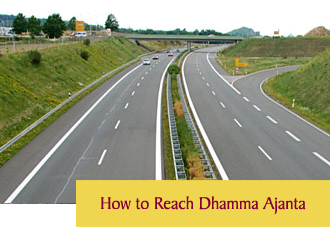 Dhamma Ajanta is one of the World's meditation centers and of a rapidly growing global Vipassana organization. It is dedicated to the teaching of Vipassana Meditationas tought by S.N Goenka in the tradition of Sayagi Uba Khin. Vipassana meditation is the personal purification of the mind. It is the highest form of awareness—the total perception of the mind-matter phenomena in its true nature. It is the choiceless observation of things as they are. Vipassana is the meditation the Buddha practiced after trying all other forms of bodily mortification and mind control and finding them inadequate to free him from the seemingly endless round of birth and death, pain and sorrow. It is a technique so valuable that in Burma it was preserved in its pristine purity for more than 2,500 years. Vipassana meditation has nothing to do with the development of supernormal, mystical, or special powers, even though they may be awakened. Nothing magical happens. The process of purification that occurs is simply an elimination of negativities, complexes, knots, and habits that have clouded pure consciousness and blocked the flow of mankind’s highest qualities—pure love (metta), compassion (karuna), sympathetic joy (mudita), and equanimity (upekkha). There is no mysticism in Vipassana. It is a science of the mind that goes beyond psychology by not only understanding, but also purifying, the mental process. The practice is an Art of Living which manifests its profound practical value in our lives — lessening and then eliminating the greed, anger, and ignorance that corrupt all relationships, from the family level to international politics. Vipassana spells an end to daydreaming, illusion, fantasy—the mirage of the apparent truth. Like the sizzling explosion of cold water being thrown on a red-hot stove, the reactions after bringing the mind out of its hedonistic tendencies into the here and now are often dramatic and painful. Yet there is an equally profound feeling of release from tensions and complexes that have for so long held sway in the depths of the unconscious mind. Through Vipassana anyone, irrespective of race, caste, or creed, can eliminate finally those tendencies that have woven so much anger, passion, and fear into our lives. During the training a student concentrates on only one task — the battle with his own ignorance. There is no guru worship or competition among students. The teacher is simply a well-wisher pointing the way he has charted through his own long practical experience. With continuity of practice, the meditation will quiet the mind, increase concentration, arouse acute mindfulness, and open the mind to the supramundane consciousness—the "peace of nibbana (freedom from all suffering) within." As in the Buddha’s enlightenment, a student simply goes deep inside himself, disintegrating the apparent reality until in the depths he can penetrate even beyond subatomic particles into the absolute. There is no dependence on books, theories, or intellectual games in Vipassana. The truth of impermanence (anicca), suffering (dukkha), and egolessness (anatta) are grasped directly with all the enormous power of the mind rather than the crutch of the intellect. The illusion of a "self," binding the mental and physical functions together, is gradually broken. The madness of cravings and aversions, the futile grasping of "I, me, mine," the endless chatter and conditioned thinking, the reaction of blind impulse—these gradually lose their strength. By his own efforts the student develops wisdom and purifies his mind. The foundation of Vipassana meditation is sila—moral conduct. The practice is strengthened through samadhi—concentration of the mind. And the purification of the mental processes is achieved through panna—the wisdom of insight. We learn how to observe the interplay of the four physical elements within ourselves with perfect equanimity, and find how valuable this ability is in our daily lives. We smile in good times, and are equally unperturbed when difficulties arise all around us, in the certain knowledge that we, like our troubles, are nothing but a flux, waves of becoming arising with incredible speed, only to pass away with equal rapidity. A Non-sectarian Technique: Although Vipassana meditation was developed by the Buddha, its practice is not limited to Buddhists. There is no question of conversion—the technique works on the simple basis that all human beings share the same problems, and a technique that can eradicate these problems will have a universal application. Hindus, Jains, Muslims, Sikhs, Jews, Roman Catholics, and other Christian sects have all practised Vipassana meditation, and have reported a dramatic lessening of those tensions and complexes that affect all mankind. There is a feeling of gratefulness to Gotama, the historical Buddha, who showed the way to the cessation of suffering, but there is absolutely no blind devotion. The Buddha repeatedly discouraged any excessive veneration paid to him personally. He said, "What will it profit you to see this impure body? Who sees the teaching—the Dhamma—sees me."